How many oil refineries does Pemex have? If many of the press reports about the tragic events that led to the death of 29 Pemex workers in Reynosa (Tamaulipas) are to be believed, the problem was an explosion in a Pemex oil refinery. 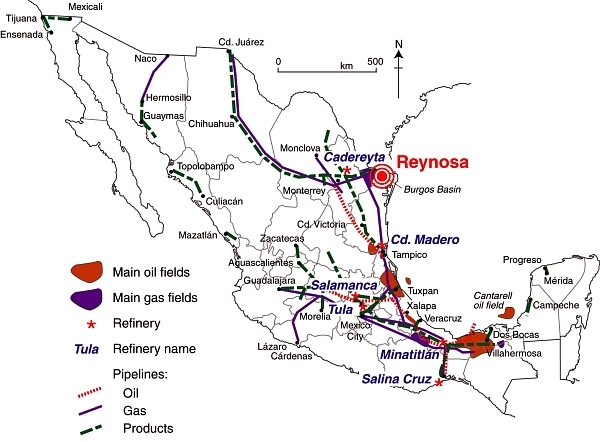 There is just one small “detail” in these statements: there is no Pemex oil refinery in or near Reynosa! The accident occurred during maintenance at a gas pipeline distribution center, which is a very different industrial installation to an oil refinery. Pemex installations in Mexico (adapted from Fig 15.5 of Geo-Mexico). All rights reserved. The six Pemex refineries produce liquid gas, gasoline, diesel, kerosene and other fuels. The state oil giant is expanding its refining capacity by building a second oil refinery, Refinería Bicentenario, in Tula (Hidalgo). Expected to cost around 10 billion dollars in total, it will have the capacity to process 300,000 barrels of crude a day and is expected to be operational sometime in 2016.